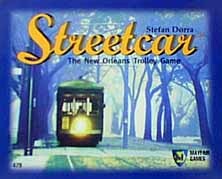 Streetcar is an enjoyable game that appeals to new and novice gamers. It also serves as an enjoyable "Beer and Pretzels" game for veteran players, or as a bridge game to help new players come into a group and eventually move on to more complex games. As a bread and butter game, however, there is limited strategy in the game, and I will give some thoughts on how to improve the game a little later in the review. The game is certainly easy to learn. In the Mayfair edition, 2 to 6 players are trying to connect endpoints of their street car line while making 2 or 3 stops along the way. The secret path is nicely handled by two randomly dealt cards naming the color and number of the endpoints and the stops for that color. Supposedly the paths are of equal difficulty, but every game we get some who complains that their route is the hardest. Once you have your secret path in hand, each player is dealt 5 tiles for laying on the board and building a street car line. The board is a simple square grid. A player may place two tiles per turn. The tiles represent rail connections from a simple straight-line section of track, to junctions, to intersections, to loops. Sections of track on the board may be replaced by other players as long as 1) the existing tile has no green bushes about one third of the tiles have bushes, usually the more complicated tracks), and 2) replacement tracks preserve the existing track connections. Thus, a left curve may be replaced by a left curve with a straight-line switch, and a straight track may be replaced by an intersection. When track first passes an attraction sqaure, represented by the beautiful sites of New Orleans (Loyola, Superdome, Gardens, etc. ), a stop sign is placed at the attraction forcing all street car traffic to stop momentarily at this space. It is in the naming of these attractions that the game gets its theme, otherwise the game is a purely abstract game. Once a player believes they have a route from start to finish that hits all the stops, they reveal their secret cards and verify that they have met their goal. Verification is important because new or drunk players often lose focus of track and make turns where none exist. If the route exists, the street car race is on, and the player places his car on the track and attempts to race it home. A common "speedometer" along the side of the board dictates the maximum number of spaces a street car may travel in a turn. Players may increase their speed by one each turn, but stops and voluntary slowdowns force the speed limit to come down. Often, players finish the track at nearly the same time such that everyone is racing for home. The first player home is the winner. In our gaming group, everyone attempts to hide their stops and endpoints as long as possible. Revealing these goals sets a player up for attacks and mischief from the other players. Assuming a player has divulged his goal, either intentionally with braggadocio or unintentionally with some play of the track, one can mess up those plans with a few nasty curves near the goal. This forces the player to make a replacement move, rather than a placement move which might get the player home. The best type of play is one that advances your track while thwarting another player. For instance, if your endpoints are on the east and west side of the board, and your opponents are on the north and south side, a straight east/west track will advance your goal and thwart your opponent. Of course the endpoints are secret throughout the game, so you have to guess. What makes this game a good, enjoyable game, and not a great, wonderful game? In all my plays, I have had a good time, but the difference in play between a novice playing blindly and that of an expert with insight is usually overshadowed by the random mix of rail tiles in hand. Thus, I believe the random deal of the tiles can easily clobber deliberation and good strategic play. This is a bit too random for me. Perhaps a remedy for this situation is to increase the number of tiles in hand to 6 or 7, which would also increase the number of choices to make on a turn. My other nitpick at this game is the lack of value in the racing portion of this game. Most strategy occurs in the tile-laying portion of the game. There is little strategy in the race portion, the street car race seems mainly a method to count out who has the shorter street car line. If one person with a good street car line is the first to complete their line, it is nearly 100 percent certain that that person will win. Perhaps optional rules for the game will help liven up the importance of the race. For one, I propose some sort of street car combat for the race portion of the game. Give each street car a maximum of five hits. When cars ram, both cars receive one hit of damage. This rule would allow losing street cars to gang up on the winner, hopefully removing them from the game. Another milder form of this rule would be to allow street cars to block each other's path or perhaps bring the speed limit down. One losing player could block the leader, allowing other players to catch up. Then the strategy of the race would at least have some sort of "befuddle the leader" decisions. Despite these nits, it is still a game I enjoy and have played many times. It is easy to learn and quick to play. And for the new players, even a random strategy never gets very far behind in the game, and so the street car race at the end is always very close. I recommend this game as a good "Beer and Pretzels" game or one for spouses and new comers who enjoy a lighter, easy-to-play strategy game. [an error occurred while processing this directive] Last modified: Thursday, 09-Jun-2011 12:37:04 MST.